Gateway City Law provide legal services in St. Louis, MO for real estate, business development and estate planning. 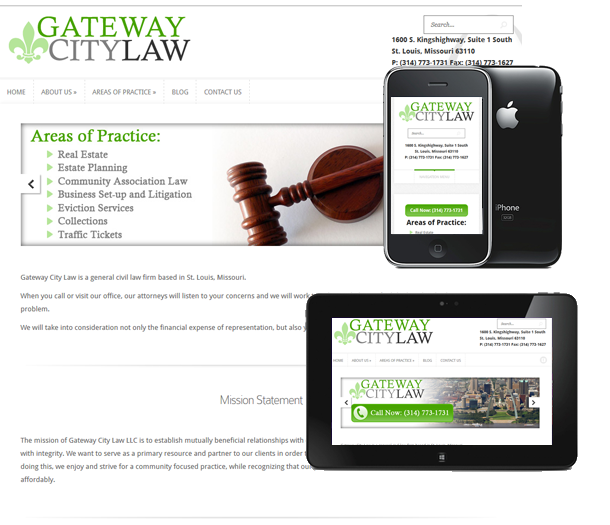 Gatewaycitylaw.com is the website for Legal Attorney Julie K. Ostrom based in St. Louis, MO and providing legal services in St. Louis for real estate, estate planning, community association law, business litigation, collections and more. Protocol Three was tasked to develop a site template that would provide up to date information about the law firm’s areas of practice and attorneys, integrate a contact form and social media, and customize a template with the firm’s chosen colors and add a little local flavor. Once approved, the content was promptly integrated and the completed design was moved to the live server. We look forward to the continued involvement in the development, growth, and success with our friends at Gateway City Law!